It's an important tipping point that puts Pakistan among the top 5 countries with fastest growing middle class population in Asia-Pacific region, according to an Asian Development Bank report titled Asia's Emerging Middle Class: Past, Present, And Future. The ADB report put Pakistan's middle class growth from 1990 to 2008 at 36.5%, much faster than India's 12.5% growth in the same period. 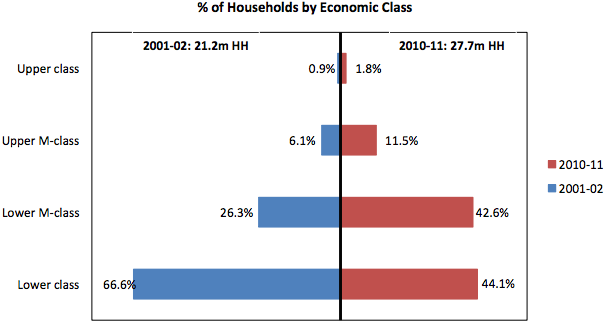 From 2002 to 2011, the country's middle class, defined as households with daily per capita expenditures of $2-$10 in 2005 purchasing power parity dollars, grew from 32% to 55% of the population, according to a paper presented by Dr. Abdul Ghani at Karachi's Institute Business Administration's International Conference on Marketing. Dr. Ghani has cited Pakistan Standards of Living Measurement (PSLM) Surveys as source of his data. Growing middle class is a major driver of economic growth, as the income elasticity for durable goods and services for middle class consumers is greater than one, according to a Brookings Institution study titled The Emerging Middle Class in Developing Countries. Among some of the manifestations of the rising middle class, Dr. Abdul Ghani reports dramatic increase in the ownership of television sets, refrigerators and motorcycles in households in all income deciles in Pakistan. At the same the total household assets have nearly doubled from $387 billion in 2001-02 to $772.6 billion in 2010-11 in terms of 2005 purchasing power parity dollars. Pakistan's transition to middle-class middle-income country over the last decade mainly during Musharraf years represents a major tipping point for the country's economy. It is likely to accelerate economic growth driven by consumption and draw greater investments in production of products and services demanded by middle class consumers. Some of it is already in evidence in booming sales of durable goods (TV sets, refrigerators, motorcycles) AND non-durables (cosmetics, shampoo, toothpaste, processed foods, etc) in Pakistan's booming FMCG sector. Pakiland offers greater mobility to its citizens than India and yet India's pci is higher, HDI is higher, per capita power and energy consumption is higher and is less food insecure and has lower hunger than Pakiland. Quite strange, isn't it? Majumdar: "Quite strange, isn't it? " The fact is that India has much bigger problems in terms of multi-dimensional poverty which includes income poverty, inequality, disease burdens and basic hygiene. India also has a huge problem of inequality relative to Pakistan. All these affect quality of life more than just average composite indicators you quote. Another point to note is that agriculture value added per capita in Pakistan is about twice that in India. Agriculture employs the largest number of people in India and Pakistan. India leads the world in open defecation. Disease burdens in India are much higher than in Pakistan. Majumdar: "No one is disputing that India has a lot of poverty. Question is if Pakiland's middle class is bigger how come it consumes less electricty/energy per capita than India. Surely middle class folks dont live without power in Pakiland? Regards"
Per Capita energy consumption in Pakistan is about the same as in India. The difference is that it's more evenly distributed than in India. A detailed World Bank report identified India as the most deprived country in terms of access to energy: as many as 306.2 million of its people are still without this basic utility. The remaining 19 nations lacking access to energy, with the number of deprived people is as follows: Nigeria (82.4 million), Bangladesh (66.4 million), Ethiopia (63.9 million), Congo (55.9 million), Tanzania (38.2 million), Kenya (31.2 million), Sudan (30.9 million), Uganda (28.5 million), Myanmar (24.6 million), Mozambique (19.9 million), Afghanistan (18.5 million), North Korea (18 million), Madagascar (17.8 million), the Philippines (15.6 million), Pakistan (15 million), Burkina Faso (14.3 million), Niger (14.1 million), Indonesia (14 million) and Malawi 13.6 million). There are some readers from both India and Pakistan who complain that I always compare Pakistan with India. The fact is that I have also compared Pakistan with other countries like Bangladesh, China and the United States. Pakistan is a rapidly growing country despite a lot of political and economic challenges. However, its growth rate since 1947 has been better than the global average. A wide range of economic reforms has resulted in a strong economic outlook. There has been a great improvement in foreign exchange and currency reserves. New businesses are opening up across Pakistan which is reshaping its landscape. The GDP growth accelerated to 4.14 percent in 2013-14 and the momentum of growth is broad based, as all sectors namely agriculture, industry and services are supporting economic growth. The per capita income in dollar terms has reached to $1,386 in 2013-14. The agriculture sector accounts for 21.0 percent of GDP and 43.7 percent of employment. It has strong backward and forward linkages. It has four sub-sectors including: crops, livestock, fisheries and forestry. revenues for the government and also contributes significantly in the provision of job opportunities to the labor force. The government has planned and implemented comprehensive policy measures on fast track to revive the economy. As a result, Pakistan’s industrial sector recorded remarkable growth at 5.8 percent as compared to 1.4 percent in the previous year. The services sector contains six sub-sectors including: transport, storage and communication; wholesale and retail trade; finance and insurance; housing services (ownership of dwellings); general government Services (public administration and defense); and other private services (social services). The services sector has witnessed a growth rate of 4.3 percent. The growth performance in the services sector is broad based, all components contributed positively in growth, Finance and insurance at 5.2 percent, general government services at 2.2 percent, housing services at 4.0 percent, other private services at 5.8 percent, transport, storage and communication at 3.0 percent and wholesale and retail Trade at 5.2 percent. The three main drivers of economic growth are consumption, investment and export. Pakistan has a consumption-oriented society, like other developing countries. The private consumption expenditure in nominal terms reached to 80.49 percent of the GDP, whereas public consumption expenditures are 12.00 percent of GDP. The government has launched a number of initiatives to create enabling environment in the country including steps to improve the energy situation, law and order, auction of 3G and 4G licenses, and other investment incentives for the investors. Moody’s recent ratings in favor of Pakistan coupled with jacking up from negative to positive rating of five of its banks — Habib Bank Limited (HBL), Muslim Commercial Bank (MCB), Allied Bank Limited (ABL), United Bank Limited (UBL) and National Bank of Pakistan (NBP) — would definitely boost investor confidence. The current government has launched a comprehensive plan to create an investment-friendly environment and to attract foreign investors to the country. As is evident, the capital market has reached new heights and emitting positive signals for restoring investor confidence. The European Union (EU) granted Generalized System of Preferences (GSP) Plus status to Pakistan with an impressive count of 406 votes, granting Pakistani products a duty free access to the European market. The GSP Plus status will allow almost 20 percent of Pakistani exports to enter the EU market at zero tariff and 70 percent at preferential rates. Award of GSP Plus status depicts the confidence of international markets in the excellent quality of Pakistani products. Pakistan emerged as one of the best performers in the wake of the global financial crisis, even with a backdrop of a country which waged a costly war against militants. Congratulations to you and all Pakis on Pakistan Day and 75th anniversary of the noble Lahore Resolution. May Pakiland become what our beloved qaid had envisioned it to be. On a sad note though, I have to break to you the news of death of one of my heroes (and I suspect yours too) of Hazrat Lee Kuan Yew (RA). May God/Allah give him heaven/jannah. Majumdar: " On a sad note though, I have to break to you the news of death of one of my heroes (and I suspect yours too) of Hazrat Lee Kuan Yew"
Yes, Lee Kuan Yew was a great man who did a lot for the uplift of his people. His life should be an inspiration for South Asian leaders. May his soul rest in peace. BTw, I did a post on Suharto's death that acknowledged Lee's great contribution along with Mahathir's and Suharto's. Lee actually wept at Suharo's bedside. The per capita consumption of energy in Pakiland and India are not "about the same" as you put it. It is 684 kwh per person in India v/s 449 in Pakiland, over 50% difference (Source: World Bank 2011). If you measure it by all sources of energy in terms of kg oil equivalent it stands at 614 kg for India v/s 482 kg for Pakiland (Source: World Bank 2011 data tables). That Pakiland has 90% households electrified is as meaningless as enrollment in ghost schools or rural Sindh since electrified households dont seem to have much power at all. Majumdar: "The per capita consumption of energy in Pakiland and India are not "about the same" as you put it." The important parameter to compare is the primary energy consumption which is only slightly higher in India. 614 Kg for India is not that much higher than 487 Kg for Pakistan. ...in fact, both are orders of magnitude lower when compared with industrialized nations. India's infant mortality rate (41) is so much lower than Pakiland (69)? India fared better on hunger and food insecurity than Pakiland? Btw, the whole job of the exercise is not to show either you, sir, or Pakiland in a poor light. I suspect the data pointers I have selected points to something very grave and something that Pakiland can ignore only at its own risk. That in the last 5-6 years (after Mushy's exit) Pakiland has severely stagnated. Majumdar: " India's infant mortality rate (41) is so much lower than Pakiland (69)? India fared better on hunger and food insecurity than Pakiland?" I am not familiar with the concept of premature fatalities, yet life expectancy of both countries is same (66) (Source: World Bank). There is however a point you are missing. you must be aware that health experts talk about the 1000 day concept- i.e. the first 1000 days- 270 day gestation period and two years of infancy- of an infant substantially determines physical and mental development over the entire lifetime. There is no question that until the 1990s at least pakiland had far better conditions than India which is reflected in the fact that till date Pakiland's health care indicators (including mortality and life expectancy) dont show up worse than India's. Thing is that these things are changing. The differential IMR and hunger we see today could be leading indicators of future health care indices. On energy I missed one more parameter. In India, 42% of households use non-solid fuels compared to only 36% in Pakiland, only marginally higher of course. Majumdar: "I am not familiar with the concept of premature fatalities"
Premature mortality stats are used by WHO and other health-related agencies. Majumdar: " On energy I missed one more parameter. In India, 42% of households use non-solid fuels compared to only 36% in Pakiland, only marginally higher of course." 110 million Pakistanis and 700 million Indians have access to non-solid fuels. The use of cleaner-burning natural gas is far more widespread in Pakistan than in India. India's rating btw is Baa3 which is full 7 notches above Pakiland's. 110 million Pakistanis and 700 million Indians have access to non-solid fuels. Please read the report carefully, sir. It is the other way round- that is the number of people who suffer from access deficit to non solid fuel. India's population is 7 times Pakilands, it means that % of people in India lacking access to non-solid fuel is marginally lower than Pakiland's. The piped natural gas network in Pakiland has been much bigger than India's because it was for long a major NG producer (Sui et al). But that gas is now getting exhausted. In India LPG takes the place of NG. Overall per capita GDP growth has been mediocre for Pakistan for quite some time. However, the middle class has grown substantially and yet I haven't come across this economic puzzle or read about this in The Economist, The WSJ etc. Anon: "I haven't come across this economic puzzle or read about this in The Economist, The WSJ etc." There's no puzzle here that basic understanding of income distribution can not solve. Headline stories of Economist and WSJ won't help you here. It's not the overall GDP growth and average per capita income increases but the median per capita income growth that tells you how the GDP gains are shared among the population. So to assess the size of the middle class, it's important to look at the median per capita income, an income level that divides the top 50% from the bottom 50% of income earners. Median income in India ($60 per month) is significantly lower than that in Pakistan ($73 per month) in 2005 PPP $ based on 2009-10 surveys. $60 per month per capita or $2 per day per capita in India means half the population in India does not meet the ADB and WB definition of middle class in India. On the other hand, media income of $73 per month per capita in Pakistan means more than half of Pakistanis meet the ADB and WB definition of middle class. Income poverty rate (those below $1.25 per capita per day) in India is 33% vs 13% in Pakistan, according to WB data on povcalNet. Also Gini Index for India is 33 and for Pakistan 29, indicating that Pakistan has lower inequality. Making technology central is typical of the Deaf Reach system. The online tools are accompanied by a book, a CD and a phone app. Computers and televisions are prominent in classrooms, and teachers are encouraged to explore the Internet for supplementary materials. The P.S.L. tools imprint three languages — Urdu, English and P.S.L. — on the children’s brains at the same time. They also enable relatives and others to learn P.S.L. even if they can’t attend regular training sessions. Meanwhile, a publicity campaign called “Don’t Say It, Sign It” shows Pakistani celebrities like the filmmaker Sharmeen Obaid-Chinoy and the cricket star Shahid Afridi signing simple phrases in short online video clips, in an effort to remove the stigma of “otherness” and incapacity from the common perception of the deaf. Ten thousand copies of the organization’s dictionary and DVDs have been distributed across Pakistan, and a second edition is in print. Next, the foundation will send “deaf leaders” to 25 cities to meet with their deaf communities and provide materials for smaller villages. By distributing 18,000 P.S.L. books and 7,000 DVD sets, the organization hopes this first phase of its project will affect 150,000 people. In a country like Pakistan, where so many other languages and communities jostle for space, and a walk down any street reveals a modern-day Tower of Babel, what does it mean to give an entire community its own language? If “a loss of language is a loss of culture,” as Mr. Awasen says, then the gain of a language is a gain in culture. So empowering the deaf can only strengthen Pakistan’s social fabric; the deaf community will be proud to take its rightful position within the constellation of diversity that is one of Pakistan’s greatest assets. Only 3% of Pakistani households (vs 6% in India) own a car but 43% (vs 47% of Indians) respondents own motorcycles. If you’ve ever witnessed traffic in Ho Chi Minh City, it’s clear that motorcycles and scooters dominate transportation there. While less common than cars and bicycles, these relatively inexpensive two-wheelers are especially popular in South and Southeast Asia. More than eight-in-ten in Thailand, Vietnam, Indonesia and Malaysia own a scooter. And the next tier of motorcycle owners are all in Asia: China at 60%, India at 47% and Pakistan at 43%. Pakistan’s tallest building ‘Bahria Town Icon’ was inaugurated with a splendid display of fireworks here on Monday night. Built by Bahria Town, the sky-scrapper soars 62 floors up in the sky in the Clifton area of the port city. ‘Karachi Icon’ houses residential apartments, a big shopping mall and hundreds of corporate offices. A large number of people turned up to witness the fireworks that sparkled the sky just above the brilliantly lit tower. The general perception still, and unfortunately, held by many people, foreigners and Pakistanis, is that Pakistan is largely an agricultural, rural economy, where “feudals” dominate the economic, social, and particularly political space. Nothing could be further from this outdated, false framing of Pakistan’s political economy. Perhaps the single most significant consequence of the social and structural transformation under way for the last two decades has been the rise and consolidation of a Pakistani middle class, both rural, but especially, urban. Data based on social, economic and spatial categories all support this argument. While literacy rates in Pakistan have risen to around 60%, perhaps more important has been the significant rise in girls’ literacy and in their education. Their enrolment at the primary school level, while still less than it is for boys, is rising faster than it is for boys. What is even more surprising is that this pattern is reinforced even for middle level education where, between 2002-03 and 2012-13, there had been an increase by as much as 54% when compared to 26% for that of boys. At the secondary level, again unexpectedly, girls’ participation has increased by 53% over the decade, about the same as it has for boys. While boys outnumber girls in school, girls are catching up. In 2014-15, it was estimated that there were more girls enrolled in Pakistan’s universities than boys — 52% and 48%, respectively. Pakistan’s middle class has realised the significance of girls’ education, even up to the college and university level. In spatial terms, most social scientists would agree that Pakistan is almost all, or at least predominantly, urban rather than rural, even though such categories are difficult to concretise. Research in Pakistan has revealed that at least 70% of Pakistanis live in urban or urbanising settlements, and not in rural settlements, whatever they are. Using data about access to urban facilities and services such as electricity, education, transport and communication connectivity, this is a low estimate. Moreover, even in so-called “rural” and agricultural settlements, data show that around 60% or more of incomes accrue from non-agricultural sources such as remittances and services. Clearly, whatever the rural is, it is no longer agricultural. Numerous other sets of statistics would enhance the middle class thesis in Pakistan. Yamaha Motor Pakistan announced the launch of their new 125cc bike vowing to cater the need of common motorcycle users in Pakistan, read a statement issued by the company. The latest model YB125Z is equipped with features like longer and wider size seat, engine balancer to reduce vibration, powerful headlight halogen lamp, self-starter and gear indication on speedometer, it said. Yamaha earlier introduced two sporty versions in the 125cc category as it introduced YBR125 & YBR125G models around two years back. YB125Z is priced at Rs115,900 and this model will be available in the market from the middle of April 2017. Speaking at the launch, Executive General Manager of Yamaha Motor Co., Ltd. (Japan) Hiroyuki Seto said that Pakistan was now the fifth largest motorcycle market in the world, and Yamaha was looking at Pakistan as a huge potential market. “We want to establish our presence in the 125cc standard segment in Pakistan,” he said. Also speaking on the occasion, Yamaha Motor Pakistan’s Managing Director Shigeru Ishikawa highlighted YB125Z as new weapon to cut into mass segment. “We have big confidence in our new product and it’s a time for us entering the next stage so our valued customers can now experience the real,” he was quoted as saying. Dr. Jawaid Ghani (Professor of Strategy & Market Research) a renowned expert in the industry provided insights on “Consumption Patterns of Pakistan’s Middle Class” based on his latest research. His research stemmed from decades of studying data, and a conviction to portray the true reality of Pakistan’s economy, in particular the strength of consumption within an average household. The presentation was held at the KSBL campus on April 18, 2017 in front of a fully-packed auditorium. Dr. Ghani commenced from a very optimistic viewpoint, stating how we stand today at the precipice of pivotal turnaround in Pakistan’s economic strength. He spoke of the phenomena of lifestyle changes once the population has a degree of financial independence and how increases in ownership of basic home appliances suggest Pakistan is moving towards a tipping point of unparalleled growth. Some key highlights of his talk were the significant shift in poverty line and movement across income brackets from 1990-2015; the rise of Asia’s booming middle class (replacing that in the West as their population levels off and they surpass basic living standards), such that these shifts in population (increasing adult, working bracket) and spending patterns implicate that consumption in Asia will be driving Global consumption in the next 20-30 years. Dr. Ghani built on these developments in contrast to the situation in neighboring China and India, to show how this will shape trade, economic dynamics, potential sub-contracting in the region with ripple effects across Africa and the world. The lively Q&A brought forward questions on if this growth was sustainable (considering a lower general savings rate), what it means for upcoming businesses and entrepreneurs and how niche markets are the place of potential. In conversation with Dr. Ghani on the context of his work, he spoke of the importance of a deeper economic analysis and the need to address the gap between what is reflected in government policies and the true reality of consumption strength plus business potential. There must be access to objective information, not a subjugation to the international perspective. For this to happen, the need of the day is for young academics, researchers to take regard of the momentous change that is happening and to document it, so the essence in time is captured. An endeavor that is currently being taken up by students and faculty at KSBL. Fast Food: 2nd largest industry in Pakistan by Prof. Dr. Noor Ahmed Memon, (Dean KASBIT, Khadim Ali Shah Bukhari Inst of Tech). Fast Food Industry in Pakistan is the 2nd largest in Pakistan. accounts for 27% of its value added production and 16% of the total employment in manufacturing sector with an estimated 180 million consumers, Pakistan holds the world’s eighth largest market when it comes to fast food and food related business. More than 1000 large scale food processing enterprises in Pakistan. 75% of rural based food manufacturers are in so called informal sector (difficulty in accessing raw material finance informal sector (difficulty in accessing raw material, finance skills, knowledge and management). Pakistan’s fast food sector is changing significantly with an inclined shift in life styles and traditional eating habits. According to the survey which was being made on the performance of the fast food business in Pakistan it was being revealed that an average consumer spends 42% of one’s income on food. Retail sales of processed foods is expand ing by 10% annually. Supermarkets are gaining in popularity as a shopping venue and now account for about 10% of all retail food sales. In addition, Pakistan now hosts numerous western style fast food chains reflecting a rising popularity with such eating style. On an average calculation the fast food business in Pakistan and the trend of eating habits of the locals in the country is increasing almost 21% annually which means the growth of the fast food business in Pakistan is more than 20% on annual basis which makes it as one of the fastest growing businesses not only in Pakistan but even in the entire world as well. McDonald’s first restaurant opened its door to the people of Pakistan in September 1998 in Lahore. This launch was met with unprecedented enthusiasm from the citizens of Lahore, who are known for their liveliness, vigor and penchant for quality food. Karachi opened its first restaurant a week after Lahore. Ever since we opened the doors of our restaurants both in Karachi & Lahore, we have been proud to provide our customers the same great taste, outstanding value and superior service that is synonymous with the Golden Arches all over the world. Baskin-Robbins, the world’s most known ice cream chain, has announced that it has signed a master licensing agreement with AHG Flavours (Pvt) Limited and aims to set up 35 Baskin-Robbins shops across Pakistan, with Lahore being the main focal priority. “Baskin-Robbins is famous around the world for offering an extensive variety of 31 ice cream flavours to its guests and we’re looking forward to treating our customers across Pakistan with the same flavourful experience,” said AHG Flavours Chairman Irfan Mustafa. AHG Flavours CEO Harris Mustafa, an industry veteran, welcomed Baskin-Robbins in Pakistan in his classic boldness, “Abhi to party shuru hoi hai,” meaning the party has just started. Baskin-Robbins restaurants in Pakistan will feature the brand’s extensive selection of classic ice cream flavours, including Pralines n’ Cream, JamocaTM Almond Fudge, Mint Chocolate Chip and Very Berry Strawberry, alongside regional favourites such as Mango Tango and Tiramisu. The brand will also offer its delicious range of custom ice cream cakes, frozen beverages, ice cream sundaes and take-home ice cream treats. Ice cream and frozen desserts grew by 10% in current value terms to reach PKR16 billion in 2016, boosted by continued product innovation, promotions and investments in the distribution network by leading manufacturers. Engro Foods (Pvt) Ltd is set to take over the leadership of ice cream and frozen desserts from Unilever Pakistan with a value share of 42% in 2016, with the former leader trailing second with a value share of 40%. New product launches are expected to continue positively impacting the category’s size. In addition, enhancements in cold chains and distribution networks will bring more remote and rural areas under the reach of leading manufacturers.